I had a little difficulty with Gail Simone's Batgirl Vol. 4: Wanted because for the most part it wasn't the story I was expecting given the end of the last volume. That's on me, however, not Simone, and indeed I found the story particularly moving at times and enjoyed it on final reflection. But surprisingly, what really sold the book for me was new series artist Fernando Pasarin's art, which I had not favored in Green Lantern Corps but which really, really works here, giving the book a realism it in some ways lacked previously. Batgirl: Wanted essentially contains two stories, the Villains Month-linked Ventriloquist story and then the "Wanted" story. The Ventriloquist story does reflect the overall circumstances of "Wanted," namely that Batgirl Barbara Gordon is being hunted by her father Commissioner Gordon for the apparent murder of her psychopathic brother James Jr., but it does not delve into it too much in earnest. The story tends to favor the new Ventriloquist villain more than Batgirl (the caper is all the Ventriloquist's, and Batgirl "just happens" to show up when trouble starts) and so the focus feels off if, like me, you're expecting Fugitive-esque Batgirl action. I don't mind a new villain like the Ventriloquist getting a profile story; I just wasn't expecting the spotlight to go off Batgirl so quickly after Batgirl Vol. 3: Death of the Family's strong finale. Given that, I thought Simone did well enough with the new Ventriloquist. It continually surprises me that the original Ventriloquist Arnold Wesker first appeared in 1988, given how "classic" a Batman villain he seems now, and it's likely a testament to it that we get a new New52 Ventriloquist as well. The two-part story reads like a horror flick (the ongoing tone of Batgirl to some extent) and Simone presents well the common "evil puppet" tropes, with the dummy Ferdie skittering along the floor and stabbing people's eyes with the blades in his hands. I tend to like my Batman villains "real" (or at least "magically real"), and Simone giving the Ventriloquist metahuman powers to control Ferdie, among others, felt too "superheroic" to me. At the same time, I can't argue with the creepiness of Batgirl having to fight two animated, decaying corpses, even having to go so far as to handcuff them, so Simone makes good use of it all. Again, if this didn't feel as though it interrupted "Wanted," I might be even more satisfied with it. "Wanted" starts with a prelude issue that mainly involves Barbara out on a date. With twenty-some issues past, Simone has by now established the character of the "new" Barbara Gordon, but I believe this is Batgirl's first issue with the hero out of costume the entire time. As such, I felt I got (or got again) who this Barbara Gordon is, her likes and dislikes, her sense of humor, and so on. Simone does especially well showing, often at the same time, Barbara's Batgirl-given confidence and also her brainy social awkwardness -- Moreover, given how confident and in-control Oracle usually was, I felt I could really see here how different, appropriately, this Barbara was from Oracle, but also how one could reasonably some day become the other. The story gets darker after the date issue, and ultimately Simone ties it all together such that the date issue is relevant. But in reading it the first time, I still felt the book was "off"; there's two not-really-"Wanted"-related Ventriloquist issues plus a tonally light date story, and at that particular point I was wondering whether the book, called Wanted, would ever quite get down to it. Fortunately, "Wanted" gets serious almost right away, when after a series of events Barbara appears to fail to stop her father from shooting said date, Ricky. Ricky is an interesting character here, who seemed in his first appearance to just be a one-off victim of the villain Knightfall, and who was brought back not by Simone, but by Ray Fawkes during his short stint on the title. Simone kept the character and impressively built a convincing relationship between unlikely partners Barbara and Ricky in the aforementioned date issue. But given Ricky's tenuous role in the book, Simone had me pretty convinced the character wouldn't make it. That's not the case -- Ricky recovers miraculously in the end (unless it's the Ventriloquist) -- but the pages leading up to the shooting are among the most harrowing in the book, intercut well by Pasarin. 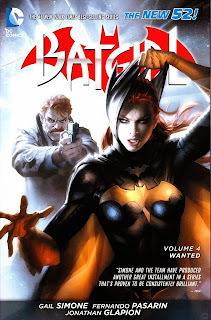 "Wanted" ultimately arrives at the Batgirl/Commissioner Gordon conflict, though there's a convoluted series of events in between involving the villain Knightfall that I didn't think was necessary (I like Knightfall and would rather see a story about her conflict with Batgirl than have Knightfall's goons play second-fiddle to the Gordons' story). The conclusion is quite affecting, though -- not when Batgirl tries to unmask to Gordon (with too many shades of No Man's Land here), but when she turns Gordon's anger around on him somewhat psychologically, demonstrating that he's really mad at himself, not her. This was unexpected, but made sense, and served simultaneously to assuage both father and daughter's guilt. I might have preferred more of Commissioner Gordon chasing Batgirl through the streets in this book, but the end is exactly what I would have wanted irrespective. The book also includes the Villains Month Ventriloquist issue by Simone (Batman: The Dark Knight #23.1) and the Zero Year tie-in, Batgirl #25 by Marguerite Bennett. Both are fine if not necessarily notable issues, and I'd prefer that DC included them than not (some books are omitting their issue #25 in favor of the DC Comics: Zero Year collection, but maybe a Bat-title gets an exception); that Pasarin draws Bennett's issue offers nice continuity despite Simone's absence. My key problem with each is that obviously something has happened in the DC Universe -- people seem hungry and desolate in both -- but neither issue takes pains to explain what the situation is. Bennett's sudden introduction of Gotham's Coldlight Island is especially confusing, and I wonder if that appears in Scott Snyder's Batman: Zero Year or not. For a reader not "in the know" about other events in the DC Universe, it seems to me this trade needed a text page or two. Batgirl Vol. 4: Wanted does not take as direct a path as I'd hoped, but there's still some excellent character work from Gail Simone here and plenty of surprises and chills. Artists like Ardian Syaf did a fine job on this book at the start, but Syaf and Ed Benes have a rounded, animated style; I felt Fernando Pasarin's figures were too human-looking to follow Patrick Gleason drawing aliens in Green Lantern Corps, but his actually-human figures in Batgirl are just right. Though Wanted gets serious, it is in some ways not as "serious" as the previous Death of the Family collection, but Pasarin does well in making the characters seem "real." That reality contributes mightily to how Barbara Gordon's personality comes forward in this book, and I hope DC keeps Pasarin on this series for some time to come.